Here are guaranteed compatible memory upgrades for your Lenovo IdeaPad 500 (15") Intel. Upgrading your Lenovo IdeaPad RAM will allow you to run your system more efficiently and increase your productivity. Adding memory is the quickest and easiest way to improve the performance of your system and can be done in just a few minutes. Installing the highest capacity memory module in each memory socket will give you the greatest performance improvement. Our technical support team is ready to help if you have any questions or problems. Don't forget to pick up a wrist strap. 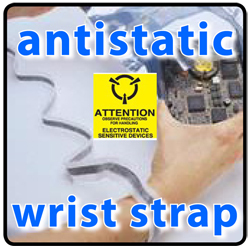 An electro-static wrist guard is essential when working with electronic components such as RAM and other computer components. When used, a positive skin-to-ground contact is established, preventing remittance of electro-static discharge (ESD) and potentially damaging electronics.